I was wanting to get more pictures of this, but a few things kept me from it. 1. Too many people in too small of a space. At any rate, it was spectacular as usual and Byron is really getting into these kind of occasion too. He was singing along too! 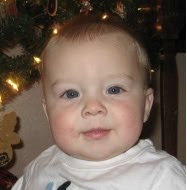 So, most of you know, maybe, that Collin had a hemangioma on the under side of the right side of his chin. It wasn't there at birth. It appeared at about 5months as a tiny red dot and began to grow...quickly! It never seemed to really bother him, but it got big enough to be a nuisance just because it would rub his clothes as he looked from side to side. It got irritated several times and then dried, cracked, and bled. And bled. And bled. After all, hemangiomas are just blood vessels. So, we were referred to a dermatologist in Lubbock. We were suppose to take him Monday, Dec 7, but after the Thanksgiving holidays, I called to see if there was an earlier appointment. Sure enough, they said to come in on Wednesday, Dec 2. We were thrilled! The appointment was at 8am. We live at least an hour and a half away...in good weather. It just so happens that the night before all of this, it began to snow. We were up, dressed, ready, and on the road at 6am! For those of you that know us well, that is a BIG deal! We dropped Abby off at Kevin's parents house to let them take her to school, and us and the boys were off! The roads were clear, no hazards to speak of, and we got there with 20 minutes to spare! The entire drive (and for many days before) consisted of potential arguments for the doctor to have something done about it as soon as possible. We figured we would need to come back at least once. The doctor walked in, looked at it, said, "Oh yeah, that is a pyogenic granuloma. (which I couldn't have told you or spelled before the letter came in the mail with the official diagnosis) We will deaden it with a shot, snip it off and cauterize it." When? THAT DAY!!!! WOW! We were thrilled! It took less time to do it than it did for me to type it out! The shots were worse than the procedure and the recovery was a little rough, but it was wonderful to not have to put a bandaid on him anymore! (which were getting to small to cover it anyway) So here is a before and after shot. Thank you, God, for modern medicine. The day before. It was growing so big and he was drooling so much, keeping a bandaid on was become a real challenge.